President Barack Obama has yet to watch a hockey game at the Verizon Center, so Capitals defenseman Mike Green and Caps legend Rod Langway will take the game to the White House. Green is scheduled to be part of a contingent that will hold a street hockey workout and clinic for local kids on a rink set up next Friday on the South Lawn of the White House. The event is part of a new collaboration between the NHL, USA Hockey and first lady Michelle Obama's Let's Move! campaign, which encourages kids to lead active and healthy lives. But the Caps won't be the only NHL team involved. 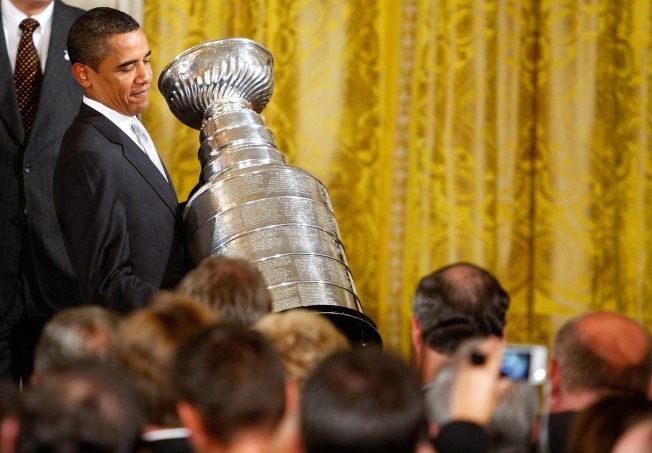 The Chicago Blackhawks are also headed to the White House at 3 p.m. that day to be honored by the Obamas for winning the Stanley Cup last season. The Let's Move! event will be held after the Cup ceremony. We mention all of this to remind folks that President Obama has watched the Wizards in person, but he has yet to "Barack the Red" and watch his current hometown Caps play in person. Even after Caps' owner Ted Leonis gave an open invitation to the president and his family (and staff) to stop by whatever game he wants. Ahem. The game on March 13 against Chicago seems like the perfect opportunity for the president. Not only is it against a Chicago team, but it's also a Sunday afternoon tilt, meaning traffic in the Gallery Place area wouldn't be as bad if his motorcade rolled in. Oh, and it's also being shown on NBC. What better way to win over hockey fans than by showing up at a nationally televised game? All signs seem to point to an Obama appearance, but we've seen that fish before. The President of the United States has an open invitation to attend and enjoy a game at Verizon Center. He has attended a Wizards game; a Mystics game; and I am sure one day he will come and enjoy a Caps game. He loves competition and sports. He is a true fan. We must be respectful of his schedule and the demands on his time. The invitation is extended and perpetual and is done so with much respect. In the meantime, you can still show your support on the Facebook page devoted to getting the Prez to attend a game. A page that, by the way, hasn't been updated since last April. Time to unleash the fury? UPDATE: Our pal Ted Starkey over at the Washington Times tweeted out a link to a great picture of Rod Langway on the White House lawn with then-President Ronald Reagan in 1983. He was there with Mike Gartner, Scott Stevens and Co. for an event involving the U.S. Olympic hockey team and the Capitals in September 1983. Check it out here.